As an established powder coater in Kent, we have expertise in most fields of powder coating. The majority of our work consists of architectural work e.g. railings and balconies. Our three paint plants allow us to powder coat thousands of small components, or large heavy structures weighing over 1.5 tonnes. Large steel work is powder coated in our big oven, able to powder coat 8m, 9m, 10m, 11m, up to 12m lengths. 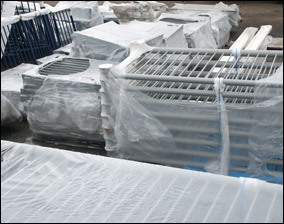 This is mainly used for structural steel, balcony uprights and staircases.